An “electronic tongue” at Washington State University is hard-wired to taste wines in a way that human tongues cannot. Unlike human taste buds, this so-called “e-tongue” never tires or takes a day off, even after hours of around-the-clock sampling, said Carolyn Ross, associate professor of food science and viticulture and enology, who runs the sensory evaluation lab on the Pullman campus. Diako appears to have met his match, though, working with the e-tongue to evaluate Washington wines. While humans can detect flavor attributes, the e-tongue identifies taste compounds at the molecular level, Ross explained. “The e-tongue gives an objective measurement of taste profiles and we try to correlate that to what happens in human sensory evaluation,” said Diako. Just as fortuitous as pairing a good wine with the right food, the new e-tongue has been paired with the right scientist. 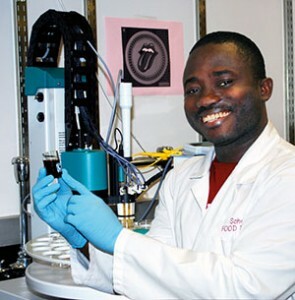 Diako joined Ross’s lab a year ago, shortly after WSU purchased the e-tongue for a role in Washington’s wine research. While there’s no way to know if the e-tongue enjoys its work, it’s clear that Diako loves what he does in the lab. The information gathered from the evaluations is important to the Washington grape growers and winemakers to guide fruit and wine flavor development, said Diako. After all, a great bottle of wine begins in the vineyard. Will the e-tongue know if that bottle does contain, in fact, a good wine?